Many times our lawns need repair after a long summer season and sometimes during. The common things that cause some repair are shade, sun, and pet urine. Most people don’t know what to do in these cases. In this post, we will briefly give you an insight on what to use for lawn repair. You have probably heard how hard it is to plant grass seed. You have to buy topsoil, fertilizer and the seed you need to use. You probably heard about dethatching to remove all unwanted grass out of the way. Well, there is an easier but slightly more expensive way to do this. What we are talking about here is using Scotts Easy Seed. What this will do is eliminate using all of the steps of repairing your lawn traditionally. This means instead of having to dethatch, plant seed, then fertilize what you planted plus applying topsoil you can just apply this premixed seed and let it do the rest. This will be great for the average homeowner who never had to follow all the steps mentioned earlier. 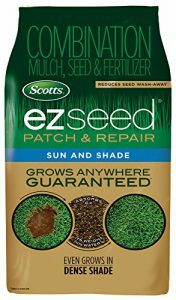 You will primarily be responsible for doing some raking up dead patches and making sure after you apply Scotts Easy Seed that you keep it watered properly. Proper watering is needed for the germination and growth of the seed. Now, does that sound easy or what? It is compared to doing it the traditional way which is a very good way but we are shooting for the easier route for those who are just simple homeowners who want to do it on their own. What Is Easy Seed For? 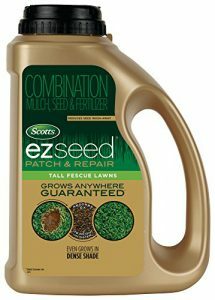 Easy seed will help you repair spots in your lawn that goes through different conditions which can affect your grass. The things that can cause problems are shaded areas, high sun areas, and areas that dogs love to urinate in. 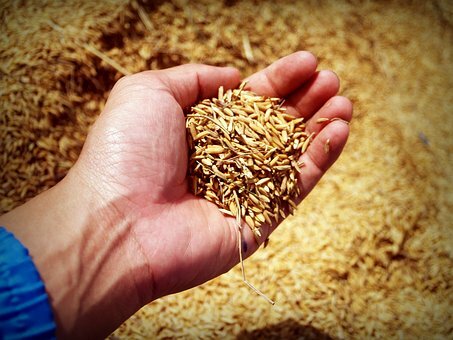 The product also comes in different varieties of seed to accommodate whatever region you live in such as Fescue, Bermuda, Centipede or St. Augustine. In case you did not know some seeds are for certain regions. The good thing about this product is it will pretty much let you know that it needs water because it will be light brown if it is not moistened. If it is it will be a dark brown. This is another way it makes your job easier helping you help it grow. Below is a video of another lawn service to give you more insight on using Easy Seed. I hope you enjoyed this post and that it gave you some information you can use. 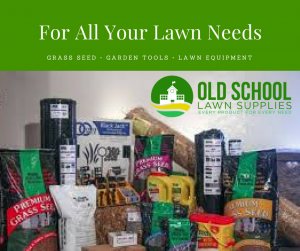 you can view these products at Old School Lawn Supplies under the grass seed category as well as pick them up at your local lawn supplies store. Thank you for visiting and leave any questions or comments in the comments section. I have used this product before and found it worked in some areas and not in others. Turns out it was me being a little too lazy. I have two dogs and they tend to destroy my yard. We tried giving them treats that help to minimize the damage due to urine. But we would forget to give them to the dogs or we would run out and forget to get more. The treats do work but I still have damaged spots. I will be following your tips here next time I use Scott’s easy seed. Any tips to repair larger areas? There are certain times you need a blend for shaded areas as well as pet areas for your yard. 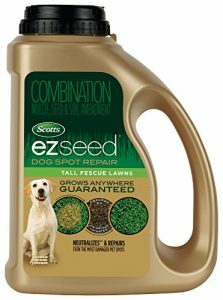 Scott does have EZ seed to help you repair those areas as well. Click here to see a product that may help you out. You would do the same thing for larger areas it just takes more time. If you are spreading out seed you would want to use a broadcast spreader for more ground coverage. I hope this helps you. Just cut my grass today!! Know I will need something like this in the spring. Is this good for all climates? I am in the Pacific NW. It is. The only difference between areas is the types of seed you should use and periods to fertilize and plant the seed. Scotts have a turf builder product that is a mix for your region. Click here to view. My father could really benefit and enjoy reading this article, great information! Wonderful. Make sure you forward it to him for his reference. I am passing your website along to my family who resides where they have lawns. I live in Arizona lawns are far and few between. Thank you very much. They could use this information if they are not already aware of it. I used to work in a Hardware store and I would always get questions asking for what I should recommend. Easy Seed was always my go-to choice. This works wonders. I even use it on my own lawn. Excellent information. A lot of people who are trying to plant grass and not really use to doing it will benefit with this product. It simplifies it but you must also do the necessary things to make sure it germinates like keeping the soil moist. That is the most important thing behind sowing seed. Thanks for the feedback. I just bought a new home in Florida and the lawn is awful, to say the least. I love a nice yard and am in need of grass. Sod is just too expensive for me and I have been wanting to seed. I have two questions regarding the EZ Seed. My yard is sand, so will I need to have topsoil brought in for the seed? Also, it is cooler right now, which is good, so how often will I need to water if the temperature stays in the mid-70s to low 80s? Also, how long does it take for the seed to start showing tiny blades of grass? You will need some topsoil for sure. About 3 to 4 inches of it over the sandy soil. But first, break up the sandy soil with a tool or tiller. Then you will need to use a starter fertilizer as well prior to seeding. When you plant the seed, rake over it lightly with the back of a rake to mix in well with the soil. Add a little compost over the new seed to protect the seeds. The trick is to keep the soil moist so the seeds don’t dry out. Keeping it moist during the germination period is very important and should show results in a couple of weeks. Click here for more details on how much fertilizer and seed to use. Excellent, just what I was looking for Ronnie. Thanks for sharing this complete and very easy guide on repairing lawns. Every year I have the same problem with my lawn and could never find the person to talk to, and always bought the wrong stuff. Now that I found your website, I will test some of the products you are recommending and might come back to you for help. You are welcome. And it would be a pleasure assisting you with anything you need help on. I always hope my post enlightens some people so they will have a better understanding of what is going on with their lawns.